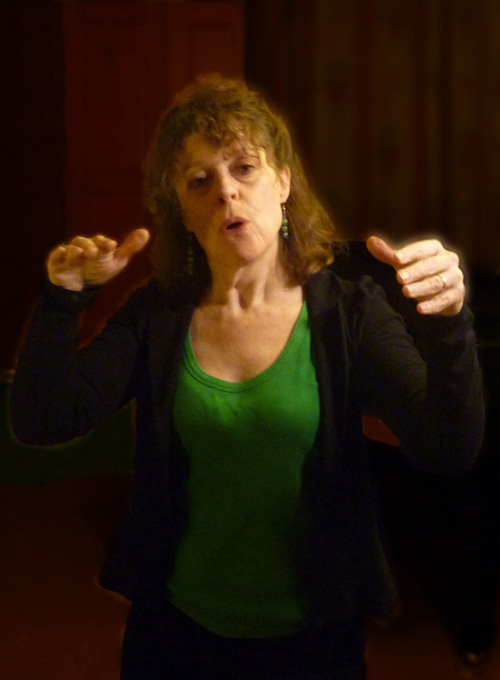 Sally is a choir leader with a dynamic and infectious style, who delights in passing on the repertoire she loves both to the singers and the audience. She is director of two choirs which meet on a weekly basis. Each choir has a unique sound brought about by the broad sphere of music Sally has worked in and the passion she has for unusual and special harmonies. She sources an exhilaratingly varied repertoire and draws the best out of a diverse group of singers. Both choirs give regular performances in and around London and occasionally abroad. The Wing-It Singers meet in Hackney and sing songs from many world traditions but specialize in Georgian, Balkan and Eastern European songs. The Cecil Sharp House Choir sings mainly Sally’s own arrangements of songs from the British Isles plus a few from other folk traditions. Sally believes passionately that it is everyone’s birthright to sing and that it is never too late to join a choir and to find or develop your voice. The teaching is inspiring and challenging..... superb and exciting! Sally has amazing drive and energy and yet is creative and inclusive. A*! There is a great mix of songs in the repertoire……makes for very interesting concerts. Love the mix of Eastern and Western European songs. I like the way it aims high but manages to be informal and encouraging as well. I love choir, keep it going forever! Performances……..galvanise us and provide a worthwhile focus. Its very exciting and satisfying when a large audience appreciates our music. Its staggering the places we have sung in!